Is cereal one of those items you always purchase during shopping trips? What is your household favorite? We like most of the Big G cereals as well as Raisin Bran and Shredded Wheat. Start the day off right with Big G cereals, and keep your stomach - and your wallet - full. 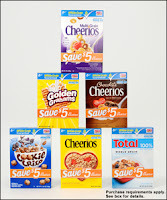 To learn more about the benefits of breakfast, visit CerealBenefits.com today. The coupons are a welcomed treat inside of each of these specially marked boxes. How awesome to pay $3 for a box of cereal and get $5 in coupons inside! This deal is much better than any toy that they could put inside the box. I took the original Cheerios and made cereal bars with it. They were awesome! Yum. Melt butter in a large pan. Add in SwirlMallows and melt. Once melted add in vanilla and Cheerios. Take off heat and mix well. Pour onto a cookie sheet and flatten with parchment paper. Top off with sprinkling on the mini chocolate chips. Once cool, eat! This pan of cereal bars went QUICKLY! I didn't even get to take a good picture. I'm happy that I snapped these few right after I cut they were made! Click READ MORE to enter the Rafflecopter super easy form giveaway. Thanks to MyBlogSparks and the sponsor for providing cereal for our review. Our own tasty words and opinions are expressed here. I guess I remember eating Frosted Flakes the most. These are wonderful....my kids love them! cocoa puffs was my fav! As a kid I always liked whatever had the best prize. :) Now I go between cereals, but Honey Bunches of Oats is always good. Thanks for sharing how to make your cereal bars. I have never tried making them with any other cereal. I bet the cheerios ones are great. We had a lot of different ones - I remember Kix, Peanut butter captain crunch. I have made a couple of course Rice Krispy bars, Special-K bars, and Chex mix! I loved Crazy Cow cereal. They had strawberry and chocolate. rice krispie treats is all i have! I hate fruity pebbles and rice krispies! The only recipe I have made using cereal is Rice Krispie treats..Rice Krispies with melted marshmallows and a bit of melted butter! I learned Frequent cereal eaters tend to have healthier body weights. I learned that General Mills has more than 30 nutritious cereals with 130 calories or less per serving. I used to eat fruit loops! I learned that on average, cereals - including sweetened cereals - provide less than 5 percent of children's daily sugar intake. I learned breakfast consumption is associated with a lower body weight. I learned that Cheerios is the only leading ready-to-eat cereal clinically proven to lower bad cholesterol when eaten as part of a diet low in saturated fat and cholesterol. I learned People who eat breakfast tend to consume less fat, less cholesterol and more fiber over the course of their day. I ate cookie crisp when I was a kid-yum! I leanred Girls who ate cereal were less likely to become overweight as young adults than noncereal eaters. When I was a kid, I loved Cap'N'Crunch! I learned On average, breakfast contributes less than 20 percent of daily calories, while delivering more than 30 percent of needed calcium, iron and B vitamins. I learned that fortified cereals provide more iron, folic acid, zinc, B vitamins and fiber than any other conventional non-cereal breakfast choice. Kids who eat breakfast tend to perform better in school and have fewer disciplinary problems. Breakfast also tends to help kids stay alert. I ate Rice Krispy when I was a kid. I learned Research estimates that nearly one in 10 American kids are deficient in vitamin D and about six out of 10 kids don’t get the recommended amounts of calcium. I learned that since 2007, they have lowered sugar levels in their kid cereals by more than 14 percent. I learned Girls who ate cereal were less likely to become overweight as young adults than noncereal eaters. Cereal consumption was associated with better nutritional status and a lower likelihood of weight gain among adolescents. I learned that ninety-five percent of Americans still aren’t eating enough whole grain, according to the 2010 Report of the Dietary Guidelines Advisory Committee. Today, General Mills delivers 37.5 million whole grain servings per day – a 50 percent increase in whole grain servings since 2004. Cheerios is the only leading ready-to-eat cereal clinically proven to lower bad cholesterol when eaten as part of a diet low in saturated fat and cholesterol. I used to eat Raisin Bran....and still do! I love this recipe with Golden Graham Cereal! Today I learned On average, breakfast contributes less than 20 percent of daily calories, while delivering more than 30 percent of needed calcium, iron and B vitamins. I learned that one recent study found people who ate several servings of whole grain each day, instead of refined grains, had less “belly fat” – the type of fat linked to higher risk for certain chronic diseases. Today I learned Vitamin D occurs naturally in many foods, including herring, catfish, salmon, fish liver oil, beef liver and eggs. But it can be difficult to get enough of these foods, especially for kids. I remember eating honeycombs and rice krispies. Still love both. Eating cereal also has the added benefit of promoting milk consumption in children. I learned that according to studies a fortified breakfast cereal can help to reduce declines in attention and memory over the morning in schoolchildren.
. Frequent cereal eaters tend to have healthier body weights. I've made rice crispy squares as snacks. Mix 5 cups of rice crispy cereal, a bag of marshmallows (50 grams), 3 tablespoons of butter. Melt butter and marshmallows, mix with rice crispies, put in a baking dish and chill in the fridge for an hour. Cut into squares and eat. I've learned that Breakfast eaters tend to have better nutrient intakes. My kids liked to make Rice Krispies Treats. Now I make this very easy snack with my 5 yr. old granddaughter. Yay! Thanks so much! Im mailing you now! Im sure this cereal wont go to waste!